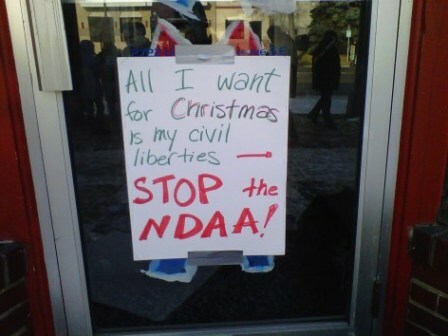 All I Want for Christmas Is My Civil Liberties! Posted on December 27, 2011 Categories NewsTags Barack Obama, Bush Torture Memos, Joshua Phillips, National Defense Authorization Act, ndaa, president obama, Torture, torture memosAuthor Coleen Rowley11 Comments on All I Want for Christmas Is My Civil Liberties! Sad, isn’t it, that just two days before Christmas, we have to stand out in the cold and worry about getting another big lump of coal from our politicians?! But unfortunately it’s expected that Obama will sign the National Defense Authorization Act (NDAA) into law right after the holiday. Since that’s the same day the big sales start, few Americans will probably be paying attention to the police state being officially ushered in. 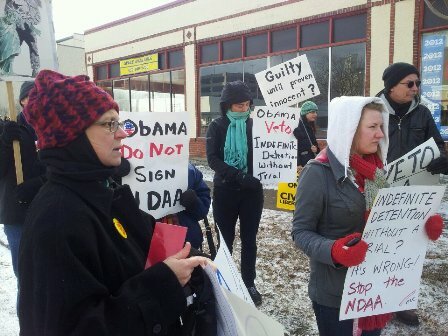 On December 23, however, we were still able to protest the despicable NDAA in front of Obama’s Minnesota Campaign Headquarters. 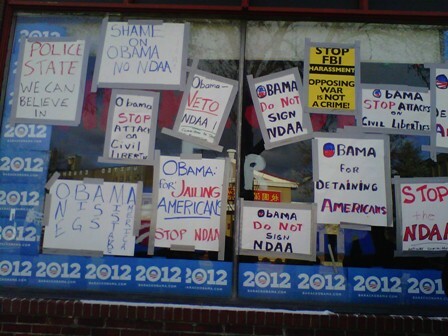 At the end of the rally led by members of “Occupy Minnesota” and the “Minnesota Committee to Stop FBI Repression”, everyone taped their signs to the front window of Obama’s campaign office, hoping he’d somehow get the message. Then we also made telephone calls to tell Obama’s volunteer receptionists to act as his better angels and plead for him to veto the NDAA. But a veto would be quite the Christmas miracle. Obama’s expected signature will not only de-link the “war on terror” from its original justification, the 9-11 attacks of more than a decade ago, to ensure the “long war” does not end, but it will keep Guantanamo open indefinitely and turn the whole world into a battlefield, including our own backyards here in the U.S. where citizens will stand guilty until proven innocent. The term I’ve personally used for this new culture of “permissiveness” is “the green light”. Unless you worked in the system, you might not recognize what the insidious “green light” is. I’ve tried to warn over and over that the green light will eventually go out and the people down the line who have gone along under its influence instead of resisting in accord with their previously ingrained sense of right and wrong are likely to pay a heavy price. Phillips’ book documents that soldiers are now taking their own lives years after having participated in the abuse occasioned by the culture of permissiveness under Bush. Instead of extinguishing the green light, Obama’s signing of the NDAA could well signal an even worse one being turned on than occurred with Bush’s torture memos.